filed: June 25, 2012 • California, U.S.
A scathing new report by the U.S. Department of Interior’s Inspector General highlights “significant failures” by the federal Bureau of Land Managment in its stewardship over more than 30,000 wind energy right-of-way (ROW) acres and another 31,000 acres of solar energy ROW sites. View the complete report at www.doioig.gov/images/stories/reports/pdf/CR-EV-BLM-0004-2010Public.pdf. The BLM is poised to add another 21 million acres identified with wind energy development potential and over 20 million acres for potential solar energy facilities, raising serious concerns over enforcement of mitigation requirements for impacts on public lands. 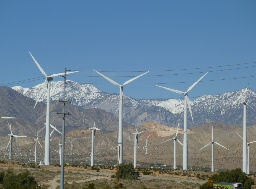 For example, in Palm Springs the BLM failed to adequately bond four wind projects, including one with 460 turbines “leaving BLM at risk to future liabilities for land reclamation and the potential damage to natural resources,” the report stated. The report is damning when it comes to BLM enforcement of mitigation requirements. 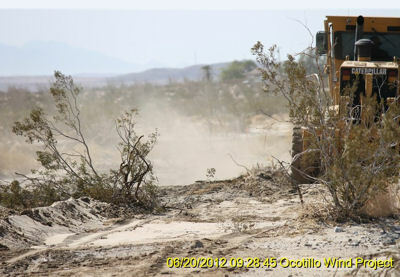 In Ocotillo, where the Ocotillo Express wind project is under construction, residents have repeatedly complained about a lack of BLM monitors and have documented numerous problems on video and with photos, ECM has learned. These include lack of adequate dust controls (which eventually led to enforcement action by Imperial Valley’s air pollution control board, after citizen complaints), apparent violations of water use agreements and failure to obtain permits from the Army Corps of Engineers before drastically altering drainage in the area. The federal report concluded from its fieldwork that “continued monitoring is important to ensure the project site is properly maintained and safe.” Monitoring activities can identify incidents such as collapsed wind turbines, bird deaths, damage from fallen meteorological towers, and oil leaks from hydraulic systems. 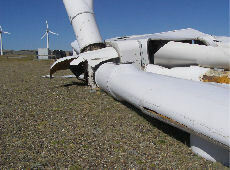 The Interior Department’s inspectors found an unreported collapsed wind turbine at a BLM wind project in Wyoming in 2010. The BLM learned of the collapse only after photos were posted on Facebook. The ownership of the project had changed hands and new owners claimed they were unaware of reporting requirements. Collapse was found to be due to a hydraulic system failure during a power outage, combined with high winds that overstressed the turbine. Leakage was caused by a faulty O-ring. Earlier inspection might have identified the leak and prevented collapse of the multi-ton turbine. The report further criticized the BLM for using third-party contracting for monitoring with no controls or oversight, as well as using a non-competitive bidding process, further costing taxpayers money. The report made numerous recommendations for improvement. File a report by mail with the U.S. Dept. of Interior, Office of Inspector General, Mail Stop 4428 MIB, 1849 C St. NW, Washington DC 20240.